The Black Hills spruce (Picea glauca densata) that I styled at the Ft. Wayne Bonsai Club's Fall Show has been in my possession for somewhere between 15 and 20 years; longer than any other tree I now have. One of its distinctions is that it survived some of my serious early mistakes. Fortunately, I eventually learned, and for the last couple of years the tree has been doing well. (See my previous post.) Last weekend it was ready for creation styling. "... the greatest danger to a bonsai ..."
"Sometimes, the greatest danger to a bonsai is the human taking care of it." I overheard Ryan Neill say that, at the 2011 Mid-America Show. I don't know what prompted him to say it, but the statement really got my attention! As I walked on I was asking myself how often that might apply to me. 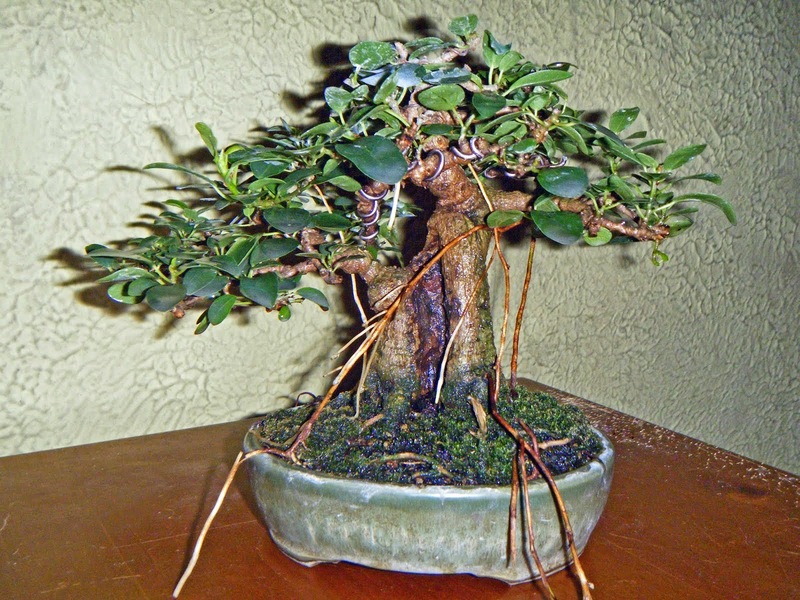 In my last post, I said that there is a story that goes with the tree I used in my styling demonstration at the Ft. Wayne Bonsai Club's Fall Show. That story is of how the tree survived the danger it was put into by the ignorance of the human caring for it. Again, maybe I should call this a "display" rather than a show. Whatever you call it, we all had a good time yesterday at our Fall Show, held as always at the Foellinger Freimann Botanical Conservatory in downtown Fort Wayne. And again, the visitors seemed to find it interesting, and that matters most. In a "typical" year, we can expect our first frost between October 6 and October 10. Jack Frost split the difference this autumn, making his first visit on the 8th. The temperature a little before 9 AM (when I walked my daughter to school) was 28° F (a little below -2° C.) Frost had formed only in places that were open to the sky, where heat could escape more freely; where there were overhanging tree branches or house eaves, there was no frost. Figuring that it would soon burn off, I grabbed my camera as soon as I got home and snapped a few pictures. Mid-America Show 2012, Part 3. Some Other Fine Trees. Not all of my pictures from this year's Mid-America Show came out poorly. (For which I'm thankful.) Here are pictures of some of the trees in the display, along with a brief comment on each one. Mid-America Show, Part 2. The Taming of the Spruce. Peter's demo tree was a huge spruce (huge from a bonsai perspective,) a Picea abies 'Gregoryana'. It was so full, before he started, that my first thought was, "It's a bush!" By the end of his demonstration, tho, he had created a very credible tree image.